Sweater. Top. Boots. Sunglasses. Purse. Chocker. and I can just be in a sweater and jeans? because I took full advantage of the warm weather. && this was out first shoot. I didn't really realize how much I missed it. Can we chat about these boots for a moment. well at least right out of the store. So, I took them to my cobbler and he worked his magic. he added a gold clasp so they don't fall down. Needless to say I took all my boots back and had this done. Best 20 bucks I ever spent! oh my goodness this is beautiful! 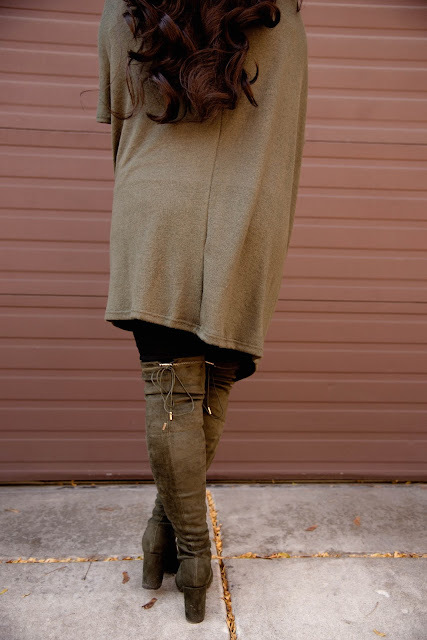 I love the green tones and those BOOTS! They're stunners for sure! Love those boots! This is definitely my favorite color recently. I love this color on you! I always see everyone wearing black suede knee-highs, including myself, but I adore these green ones. Great pick. I agree I knew the color was unique but that it was such a neutral that I could get away with it forever!! Thanks lady :) I love the boots too!! Love all the olive green here- soooo good for fall! It's going to be in the 70's this week in KC- definitely not quite fall weather just yet!